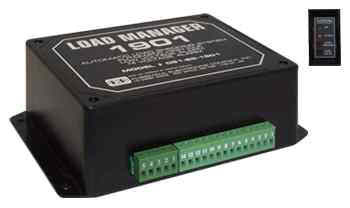 The Load Manager 1901 is designed to meet and exceed all the requirements of NFPA 1901. Eight loads are sequenced. Load shedding is accomplished in two zones. Zone one for lights that may be shed when on the road. Zone two for lights that may be shed at the scene. Selection of shedding modes is through the parking brake switch or the neutral safety switch. Whenever the vehicle parking brake is set and “high idle” is selected, a low voltage will produce a high idle output before shedding any loads. High idle will continue for 2 minutes after the voltage rises to eliminate engine speed cycling. High idle is immediately reset when the high idle switch is turned off or the parking brake released. A high voltage detector is provided to detect when the sensed voltage exceeds 15 volts. 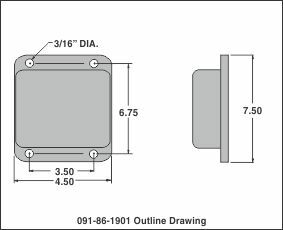 High voltage, low voltage and load shedding set points are individually field adjustable. Load shedding priority is determined by the wiring connections to the Load Manager. External relays, not provided with this Load Manager, are required to switch the loads.